One of our readers recently asked me to provide my settings from the Nikon D600 / D610 cameras that I use for my photography needs. While at first I thought that it was an odd request, it got me into thinking that many photographers probably get lost trying to dig through the many menu options. Since I have been shooting with Nikon for a number of years now, those settings are very easy for me to understand and I apply them over and over again for each camera that I work with. In this article, I want to provide some information on what settings I use and shortly explain what some of the important settings do. Please do keep in mind that while these work for me, it does not mean that everyone else should be shooting with exactly the same settings. The below information is provided as a guide for those that struggle and just want to get started with a basic understanding of menu settings. Before going into the camera menu, let’s first get started on the exterior controls. The D600 / D610 have a lot of menu options, but there are some things that you can only control with the external controls. Now if you rotate the front dial with your index finger while holding the same button, you will get many different options like “S”, “D 9”, “D 21”, “D 39”, “3D” and “Auto”. These settings are there for controlling the focus points that you see inside the viewfinder. Once again, most of these are already explained in detail in my autofocus modes explained article, so I won’t go into too much detail here. If you don’t know where to start, keep it on “S” (Single), which lets you choose one single focus point that the camera will use for focusing. Let’s move on to other external controls. Right above the AF / M lever, you will find two buttons: “BKT” (Bracketing) and Flash. These should only be used in some situations such as when shooting HDR images or working with flash. Just make sure that when you press the BKT button it shows “0F” on the left side of the top LCD – this means that bracketing is turned off (and it should be by default). The flash settings don’t really matter, but for now just make sure that everything is turned off and shows “0.0” when you press and hold it. The lower dial has a bunch of shooting modes like “S” (Single), “Cl, Ch” (Continuous low and Continuous High), “Q” (Quiet), Timer, Remote and Mup (Mirror lock-up). Mine is usually set to “S” which only fires a single shot when I press the shutter release button. If I want the camera to fire multiple shots when shooting action, I switch to “Ch”. I rarely use other settings, but those can be useful as well, particularly the timer feature that I use when shooting landscapes to reduce vibrations (more on this below). “Image quality” is obviously set to RAW, since I only shoot RAW. “NEF (RAW) recording” is always set on mine to 14-bit Lossless compressed, since I want the best image quality the camera can provide. “White Balance” is Auto and all other settings like Picture Controls, Active D-Lighting, HDR, etc. are turned off, since none of them (with the exception of “Long Exposure NR”) affect RAW images. Remember, RAW files contain non-manipulated data and require post-processing, so the above settings only impact two things: images displayed by your camera’s LCD screen (each RAW file contains a full-size JPEG image, which is what is used to display images) and if you use Nikon’s proprietary software like Capture NX, those settings can be applied to RAW images automatically. Since I use Lightroom to store and process my images, the second part does not apply to me. And I also do not care for how images are displayed on the camera’s LCD, so I leave everything turned off. The big menu setting that I frequently change is “ISO sensitivity settings”. Most of the time, I use Auto ISO, because it is a great feature that saves me a lot of time. Instead of specifying ISO for every shot, I just have it set on Auto, with its base ISO set to 100, Maximum sensitivity set to 3200 (my personal limit for “acceptable” noise levels) and Minimum shutter speed set to “Auto”, which automatically changes the minimum shutter speed to match the focal length I am using. When using a VR lens, I might lower the “Auto” minimum shutter speed to “Slower” and if I shoot with a prime lens and want to have faster shutter speeds (say when photographing wildlife), I move the slider towards “Faster”. When photographing landscapes or architecture with the camera mounted on a tripod, I turn Auto ISO off and use ISO 100 for the highest dynamic range and lowest noise levels. That’s a lot of options! Once again, I won’t go into details about each setting, so let me just go over the most important ones that you should know about. The “Autofocus” section is pretty important, because it controls the way your camera autofocus is configured. The first two settings “AF-C priority selection” and “AF-S priority selection” are there to assist in shooting in Single or Continuous modes. By setting it to “Release” in AF-C mode, you are telling the camera that it should still go ahead and take the shot even if it thinks that the image is not in focus. While the camera will do its best to acquire focus, it will not refuse to fire when you press that shutter release button. The “Focus” setting in the “AF-S priority selection” selection forces the camera to acquire focus before taking the shot. Unlike earlier DSLRs like Nikon D700, the D600/D610 will still let you take a shot if you “focus and recompose” in AF-S mode. “AF point illumination” is used to light up the viewfinder focus point(s) and different grids in red color when you half-press the shutter button. I usually keep this on “Auto”, which does not light up in very bright conditions where I can clearly see everything in the viewfinder, and only does it in darker environments (which helps with identifying my focus point location). I do not like when my focus points roll over to the other side of the screen when I am in the corners and I like to shoot with all focus points enabled, so my “Focus point wrap-around” is turned off and the number of focus points is set to 39. The “Built-in AF-assist illuminator” is that lamp on the front of the camera that is engaged when shooting in AF-A or AF-S focus modes. If the subject is dark, the front light will turn on and illuminate the subject you are photographing, which will help the autofocus system to acquire proper focus. I find the light to be helpful in low-light situations, so I keep that setting turned on. The big setting that I often rely on when photographing landscapes is “Exposure delay mode”. This feature is a gem on the latest Nikon DSLRs, because it first lifts the camera mirror (which generates a lot of vibrations), then waits a specified amount of time and only then opens up the shutter to capture the image. The nice thing is, you can specify up to 3 seconds of delay, which can completely eliminate the dreaded “mirror slap”. When I conduct my landscape photography workshops, I often walk around the participants and check how they trigger their cameras. Those who do not have camera remotes (remote cable release) initially feel frustrated, but once they discover this neat feature, they don’t regret that they did not bring remote triggers anymore. The best part about this particular feature is that you can actually use it in conjunction with the camera timer! If you set the secondary dial on the top of the camera to Timer, then set the “Self-timer delay” to something like 5 seconds, you can completely eliminate camera shake. Basically, the initial 5-second timer is for the camera to settle after you press the shutter release. After it waits for 5 seconds, the “Exposure delay mode” feature kicks in and the mirror is raised. The camera waits 3 more seconds before the shutter finally opens up and the image is captured. This is a great feature that I highly recommend to use when photographing landscapes and architecture in low light conditions / very slow shutter speeds. The “Controls” section is something I always change, because there are some time-saving features there. Let’s first start with the “Assign Fn button” menu option that allows programming the “Fn” (Function) button on the front of the camera. Since I shoot in different environments a lot, I like to be able to change my Auto ISO settings quickly. Unfortunately, Auto ISO is buried in the “Shooting Menu” and takes too long to get to. I love being able to access Auto ISO with just pressing the Fn button and that’s something you can set up very easily. First, go to “My Menu” section of the menu. Then go to “Add items” -> “Shooting menu”. Find “ISO sensitivity settings” and instead of getting into this menu, simply press the “OK” button. The next screen should say “Choose position” and you will see “ISO sensitivity settings” there. Just press “OK” one more time and you will see this on the top of the “My Menu” window. If you already have some favorites saved, make sure to move this one to the very top. Once you do this, go to the “Custom Setting Menu” again and navigate to “Controls” -> “Assign Fn button”. From there, pick “Access top item in MY MENU” and press OK. Now test it out – close the menu, then press the “Fn” button on the front of the camera. If you did everything right, the back LCD should get you right into ISO sensitivity settings! Pretty neat and saves a lot of time! If you don’t particularly care for the depth of field “Preview” button, you can program your D600 / D610 to do the same thing from that button instead. Once you do this, your camera will no longer autofocus by half-pressing the shutter and will only respond to you depressing the rear AE-L / AF-L button. It is a neat feature that I always use by default on all of my cameras (higher-end DSLRs have a dedicated AF-ON button), so I would recommend to explore this feature on your D600 / D610 as well. Not much to go over here, because this is the area that you will only use for particular tasks like setting time/date, adding image comments, adjusting LCD brightness, formatting memory card, etc. Once you learn your way around the camera menu system, I would highly recommend to play with the “User settings”, which allow you to save different settings for two different scenarios (U1 and U2). For example, I have mine set up for two different roles – landscapes and people. When photographing landscapes, I want my camera mode to be Manual. I want “Exposure delay mode” turned on by default and set to 3 seconds. I want my Auto ISO turned off, with ISO set to ISO 100 by default. So I set all those settings on the camera, then go to “Save user settings” -> “Save to U1”. For photographing people, I want my camera to be in Aperture Priority mode, I want “Exposure delay mode” turned off, because I will be shooting hand-held and I want Auto ISO turned on. I then save those settings to the “U2” slot. Once everything is set up, I can simply switch back and forth between the two using the top camera PASM dial and it saves me a lot of time, since I do not have to remember which settings I need to change. I love this feature on the D600/D610 and really wish Nikon implemented the same system on high-end DSLRs like D800/D4 as well! While Nikon does have a way to store custom settings on the D800 and the D4, you have to do it for each menu item separately, which is just stupid and inefficient. Plus, those cameras do not have an external setting on the dial to be able to change modes quickly. You are most welcome Tracey! This is a great article. However, everywhere I look I cannot find simple directions on how to start taking video on the d600. Do you have any straight forward directions I can follow to take video? Have you tried reading page 57 of the instruction manual? makes it easier I do also have one question on my d 90 i could turn the on/off dial around further to lite up my top lcd and the rear monitor on that camera. Nothing wrong! 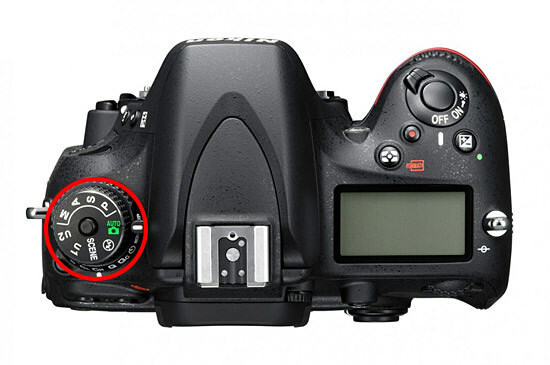 The D610 on/off switch will only illuminate the top LCD when moved to the right. Pleasure. Actually I mostly forget the rear Info panel even exists! I’m so used to using the top LCD!! and how much you constantly give of you, to improve our photography. your site and their responds is always very positive. Hans, thank you for your feedback, I really appreciate it! I agree with Hans van Boxtel. I’ve been following Nasim for a couple of years and his thorough tact with “us readers” is unmatched. Nasim, thanks for all the details you’ve taken the time to learn and share! Why do you shoot in sRGB Color Space instead of Adobe RGB? Since the pictures are in RAW (NEF) the color space is irrelevant. It only affects jpg. Carlos, because color profile does not matter for RAW images. If I were shooting JPEG, then I would pick Adobe RGB. I have a stupid question.. Can you focus and recompose while using continuous servo? Agree, good article and looks like Nasim and I use the same settings! I use the AE-L button to focus and if you do this, then you can focus and recompose using in AF-C. ALthough I may not be completely understanding the question!?! Depends on how long you’ve set your focus lock in AF-C mode. If you’re quickly recomposing, it should work. Also, if you set your focus point according to your planned composition, you should have no problems with recomposing either. Most of the time though, you would want to work with AF-S. Thank you for your response I will try that. Here’s an article to show you how to setup your D600/610 to do that. Again, as Jaimie said, if I understand your intent. Good video, this is how I understand it – setting the AE/AF lock button to use AF-C on all the time, it’s a great way of shooting. AF-C forever! Absolutely! In fact, on higher-end cameras like D800, there is no AF-A mode, so I just shoot in AF-C all the time. Nasim, and what about shooting panoramas? How you would lock exposition to have consistent images on D600 and others bodies that have no dedicated AF-On button? Or some other button can be mapped to the AE-L function? Thanks for the heads-up concerning the factory fix for the D600 oil spotting. I spoke to a rep from the tech center in NY. This is going to be a permanent fix, not a cleaning. The shutter release and other parts of the mechanism that were at fault are being replaced. I asked if this reset the shutter count to zero. His response was ‘no.’ According to this tech rep, there are many other components (electro, mechanical) that comprise a shutter release and this is only a mechanical replacement. According to this tech, there are parts available for the fix and that turnaround time, today, before many more arrive for repair, is ten business days. Hope this information is informative and helpful to others. Your blog is first rate. My D600 had the shutter replaced at the NY Nikon facility. Upon receiving it, I put my lens back on and never removed it, not even once. After a couple thousand actuations, the spots were back again, in the same general pattern as before. It would appear that the D600 shutter replacement is not a permanent fix. On the Nikonites forum, there are others who have reported this, even some with multiple shutter replacements done by Nikon on the same camera. This has been well documented for a long time now. Back in February when initial shutter replacements were being done it was thought that it would cure the problem given the redesigned shutter unit that was being fitted, but it proved not to be the case for some (not all) and by now many users have had their D600’s replaced with the 610 after 3 or so repairs, as have I! Happily I can report no further issues with the D610. the camera settings you are describing work well 90 % of the time, that is, if you shoot objects or people during the day. I don’t want to be nitpicky, but for me as a concert photographer, half of these settings are simply not practical or sometimes even a strict no-go. Well, he DID say they were HIS settings and different settings would work for different people. Personally, when I read these kinds of posts, I pick and choose the settings I like, disregarding the rest. Fabien, please note that the above settings are generic and mostly for beginners. I often end up changing many of the settings depending on what I shoot. As for your “half of the settings” comment, I would imagine that aside from some some main things like ISO, AF settings, etc, most settings would stay the same? I always welcome good content from our readers. If you have some tips to share, please use this form to send me your article, along with some sample images. As always, you’re a great help for us beginners. I would like to ask if there are differences for D800 and why do not you talk about the White balance. I think it’s the most important parts of settings to make the picture better than the characteristics of the sensor. Thanks for your patience, Giancarlo. Giancarlo, I am working on a separate article like this for the D800 / D800E (due to popular demand). As for white balance, I mostly leave mine on Auto as well. When shooting RAW, white balance can be changed to anything. If I don’t like what my camera gives me, I can change that easily in Lightroom/Photoshop. Thank you, your suggestions are always valuable. I look forward to your work. But if you can avoid working with LR would not be better? B) I have your gel stick and COULD clean it myself. Though I understand I would have to do it again and again. I suppose replacing the faulty shutter unit is a permanent solution?! John, yes, I am planning to put it in a box and hopefully ship it out this weekend. I wouldn’t worry about potential damage to the camera. If anything is wrong (which 99% of the time does not), you can send it back and they will repair it for you. Yes, the sensor gel stick is a great product, but the shutter mechanism is defective and it is best to get it replaced. On both of my two consecutive D600 cameras shutter mechanism was replaced: Once in March-April (spots started to show up after aprox. 400 releases) and the other in November of 2013. The first time I have waited for my camera for 5 weeks to get it back. The second time it was only about 12 days. Both replacements did not do their work. That means, that after the first repair in my first D600 camera oils spots started to show up again after about 400 releases, which led into a camera replacement. After my second repair on my second D600 I’ve started to see first oil spots after about 1000 exposures. Re-occurrence of spots after that repair was after aprox. 700 releases. Both cameras were additionally sent for sensor cleaning (2 times each) and were cleaned by myself 2 times each. Maybe Nikon improved their repair shutter mechanism part or just started to install the one from the D610? I do not know. The fact is, that this entire Nikon repair campaign will have to be observed thoroughly. One thing to add. 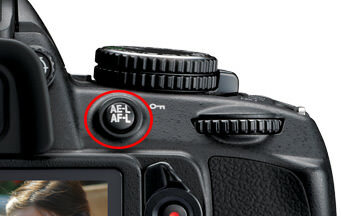 If you use AE-L / AF-L button for focusing, you lose its original functionality. I hear many assign this to Preview button (on the front). It works great for me. It is a very useful control when shooting in high contrast environment and when sitting with a flash. I also noticed that when using the preview button for “DoF Preview” the exposure is locked while the lens is stopped down – makes sense, right? Is there is any harm in shooting while holding the preview button down? Seems to work. Bill, all that’s happening when you press that button, is the lens aperture changes to whatever value is set (which is why there is so much darkening at small apertures). There is no harm in shooting while holding the button, but why would you do that anyway? I was thinking that since it also locks the exposure, I wouldn’t need to dedicate another button to the AE-L function – could just use DoF preview function to accomplish two things. AE-L is not something I use often, but your article prompted me to play with my settings yet again, which in this case, lead me to learn something new. Thanks for your personal commitment to these posts and the education you provide. Vitalishe, thanks for pointing this out! Yes, you do lose the original functionality and you can certainly add it back by programming it into another button, like the Preview button. Would these settings be similar for the D300 and D800? Bob, I am working on a separate article for the D800! Another way to quickly change Auto ISO: hold down the ISO button (lower left on the back of the camera), and toggle auto on or off with the front control dial. My D600 is configured with the bottom Fn button changing AI lens settings, the top button set to exposure lock (AE-L), and the AE-L button set to AF-ON – I wish there were a couple more programmable buttons available! Thanks for the enormously helpful article, Nasim! To add to dr’s comment about changing Auto ISO on/off without diving through menus, you can change the raw ISO setting by holding down that same ISO button and using the back control dial. There’s lots of shortcuts you can get by pushing the buttons to the left of the LCD and spinning control dials (White Balance being the other one I use intermittently). Also, as another use case, I changed the back-button to simulate the AF-ON button, but then changed the U1 setting to save the out-of-the-box settings for the camera. This helps for those times when I’m handing my camera to someone else who’s a novice to DSLRs, where they expect the half-press to focus the photo. If I could, I’d set it up so that going to U1 turned on Live Mode, too, because I’ve found that cell phones and point-and-shoots mean everyone expects to use the LCD instead of the viewfinder to set up their shots. I expect I hand my camera over to other people a whole lot more than Nasim does, though! Dr, thanks for pointing this out. While you can use the button to turn Auto ISO on and off, you cannot access/change the important sub-menu items like minimum shutter speed – that’s why I set mine to the Fn button. I just finished reading your excellent article on Recommended settings for the D600/610. I’m a D800 owner and am curious to know if you have plans on doing a similar article on the D800. I would really like to know. Thanks much for the great job of mentoring. Warren, yes, I will publish another one tonight/tomorrow for the D800/D800E. Thanks for this wonderful post. One question so far. Under ISO settings you mention you use Auto ISO most of the time, which I thought of using but wasn’t sure it would work for me. I do a lot of wildlife photography and shoot in Aperture Priority Mode, and like to change my ISO setting to help keep my shutter speeds at least at my focal length. You say you set “Minimum shutter speed set to “Auto”, which automatically changes the minimum shutter speed to match the focal length I am using.” So does that minimum shutter speed at auto keep the shutter speeds at or above the focal length of the lens? I so appreciate this website, your reviews and posts, which have all been very helpful. Thank you! Cindy, Auto ISO works like a charm for wildlife photography! When using the “Auto” setting for minimum shutter speed, the camera automatically sets the shutter speed to the current focal length. What’s great about this, is that if you use a zoom lens, the camera will automatically adjust the minimum shutter speed! Also, if you are not happy with the shutter speed = focal length, then you just move the slider to “faster” and the minimum shutter speed will increase even more. I love this new feature and I really wish Nikon went back and added it to the older cameras that don’t have it. Thank you, Nasim. I read this article about the D600/610 settings out of curiosity, and because I’m thinking to moving up to a full frame camera and the D610 looks like it would be a good choice for me given the cost and that it has good features for wildlife photography. I’m actually using a D7000 at the moment, but It seems a lot of the features and settings you review are available on the D7000 so I learned quite a bit, including the Auto ISO. However, the D7000 doesn’t seem to have an “Auto” setting for the minimum shutter speed, and so doesn’t have the slider you mention that I could move to “faster.” So I guess I could set the minimum shutter speed if I’m using a fixed focal length but it wouldn’t be as helpful for me on a zoom. Is that correct? Perhaps this is another reason to switch to a D610. You can set a minimum shutter speed within the ISO sensitivity settings. Turn on the AutoISO control. Pick the minimum shutter speed you desire. Set the desired range of ISO to use. As available light decreases and you reach your maximum desired ISO setting then the shutter speed begins to get longer. By setting a higher level of acceptable ISO you can keep your desired shutter speed short in lower light situations, but at the expense of added ISO noise. The D610 is a great FF choice in moving from the D7000. Both have excellent image quality, but the improved higher ISO capability of FF helps both when low light or faster shutter speeds are needed. Thanks for putting time in to post such a good, well timed article yet! It is well timed since my D610 arrived a couple of months ago and it’s pretty amazing. This article has given me a chance to ask a gnawing question I’ve had different people say different things about. You’ve set up your colour space as sRGB. Do you find it much different from adobeRGB especially as you use Lightroom or is it mainly to coincide with printing? I’m not answering for Nasim but this is a fairly complex and important consideration. Since AdobeRGB is a larger color space than sRGB, it’s better for editing (LR or PS, etal.) and printing (from a program that understands it) but when outputting for the internet or an unknown recipient, sRGB is better for compatibility purposes. In any case, I would ALWAYS shoot in AdobeRGB and do my final export, when appropriate, to sRGB. If you export to JPEG in AdobeRGB, you might get a very unpleasant surprise. I can’t imagine why Nasim shoots in sRGB. Simple, Nasim says he shoots RAW. AdobeRGB and sRGB only define the color space for SOOC Jpeg’s which he could care less about. I’d recommend sRGB to casual shooters as well as 1) most will not shoot in RAW and 2) most won’t have monitors capable of correctly displaying AdobeRGB Jpegs. I had to look it up to verify but, of course, you are right: color space is not applied to RAW files, in camera. It makes sense but I never thought about it because most everyone who suggests you shoot in RAW also suggests setting the color space to AdobeRGB. Given that, I guess it makes sense to set it to sRGB, for the reasons you mention. I’ll have to do more research, though, before changing it to sRGB. In my case, it probably doesn’t matter since I never shoot JPEG. Although I shoot in RAW, I set color space to AdobeRGB rather than sRGB. Why? Because it affects JPG, which is displayed on my camera LCD. By setting to AdobeRGB, hopefully it will give less “false alarm” of clipping highlights and shadows since it is larger than sRGB. Hi Nasim from Cadiz-Spain, the Paco de Lucia’s land. Thanks for all yours articles, are very good for my. I apologize for my english level. I thought that the camera works internally with configuration parameters to calculate the histogram, for example, and then show it in the LCD screen, and therefore if it is important to set the RGB color space. Is this so or not? Marco, thank you for jumping in with your comment, I really appreciate it! You answered it perfectly – color profiles are not important for RAW files and only affect embedded JPEG images inside RAW files (which get re-rendered in Lightroom anyway). Patrick, please see my comment #48 below – color profiles are not relevant for RAW files, so it does not matter what you pick. AdobeRGB is indeed larger color space and if I shot JPEG, I would certainly pick AdobeRGB over sRGB. Daniel, you are most welcome! Nasim thanks for the reply! I understand the need to also have the JPEG settings turned off as this can affect the image preview. I shoot RAW 99% of the time, but on odd occasions like some events I need to quickly transfer some JPEGs to an iPad to transfer so I can email them. For this I try to keep one of the user settings (U1) for quick JPEGS. One thing I would like to know is if there are a decent set of JPEG options like the amount/levels of NR, picture colours (portrait) etc. that people prefer on Nikon cameras that can make the JPEGs look half-decent for direct usage. That way I can just flick the switch and shoot some JPEGs without having to go diving back into the menus and changing everything. Thank you for your comment! I don’t think any of the settings get in the way of making pictures – Nikon does a pretty good job with shipping cameras with good-enough default settings that are easy for beginners. It is only when you start digging through the stuff and try to understand what each setting does when it can get a little confusing. Here’s someone making the case for the Df methinks!! On the contrary, 35mm is the *best* way to learn composition, exposure, and the technicals skills of photography. Yes, it can be expensive, but that is a small price to pay, so to speak, for learning the essentials of photography the way they *should* be learned. And with all due respect, your statement about “giving up” is totally untrue. The beginner with a 35mm in his/her is much more likely to embrace the fun and learning curve with a well crafted and basic 35mm in hand. You a little off base there, I’m afraid. As a beginner in the late 1990’s I shot 35mm film cameras and learned a bit, but found the learning curve steep, found the cost of film and relying on someone else to process it frustrating, and I did give up. I tried again this last year with a DSLR and I enjoy the immediate feedback of a DSLR and I feel it enables to me to learn more quickly from my mistakes, and as a result I’m getting increasingly better results. I also very much like that I can now process my own images without all of the darkroom equipment. I enjoyed shooting film but I wouldn’t go back. I can appreciate taking time to learn your craft, but the same principles apply to digital, and I believe with digital it’s going to take me at least a decade or two to feel competent. Just because digital is more immediate it’s not easy and it does take time to learn. There’s no need to be afraid ;-) The fact is: some people will give up and others won’t. I bought a Minolta SLR in 1979 and, after about a year of trying, I gave up. I couldn’t find any good resources to learn, living in a rural area there wasn’t anyone to help me, of course there was no internet to find information and, as I said, I spent a lot of money to take pretty bad photos. It was frustrating, and not a bit fun! Later, when digital cameras came on the scene, I tried again with moderate success. Eventually, I decided to get a dSLR and voila! I’m happy as a pig in…well…you know what. I’ve since moved up to FF and I love my D600, spots and all! No plagues, frustration, or learning difficulties. To bring it full circle, now that I’m very comfortable with SLR cameras, I’m going to try my hand at a 35mm film SLR again. Without my experience with digital, I would have NEVER considered that. Many thanks for a superb article, I learnt a lot from it. I do have a question – I belong to the D600 Facebook group and recently the oil issue has been intensely debated. Your comment about the shutter curtain rubbing causing dust is interesting but doesn’t explain the oil problem and many users who’ve had a new shutter fitted report the dust issue returns. Is the replacement shutter simply more of the same thing or has it been redesigned to eliminate the problem? I’ve been lucky so far and haven’t been affected by the oil problem, a little dust but I use a big zoom so not too surprised by that. Finally do we have any idea of the percentage of 600’s affected by this issue since not all are it seems. Mark, unfortunately, most people cannot distinguish between oil and dust. I am convinced that the majority of those that report “oil” issues, actually have dust. They somehow think that if the particles stay when they use the self-cleaning option in the camera and when they use a blower, that it must be oil. In reality, oil is quite rare to see on cameras. Oil can only happen in the initial use of the camera and is not something that just randomly comes back. Cleaning oil is very challenging and requires wet cleaning with the right liquid solution. As for the shutter issue, if the shutter is not fixed, the dust will keep coming back, because the blades will continue to produce more particles for a while. That’s why Nikon is replacing the whole shutter – the supplier that Nikon used for the shutter mechanism provided faulty units and those have to be completely replaced with different ones. The D610 does not have the same part, which is why there is no issue. 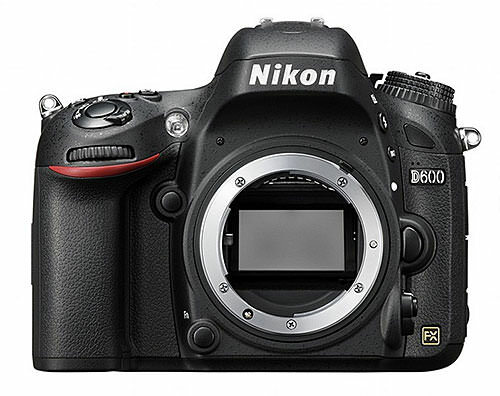 The shutter that Nikon is putting on the affected D600 units is the same one from the D610. Now regarding those that are seeing dust come back even after shutter replacement – if you read the previous article on the D600 service advisory, you will see plenty of comments from owners of completely different cameras like D7000 that claim their cameras have exactly the same problem. Unfortunately, it is from those that expect to never see ANY dust on their cameras! I did not respond to those comments – if anyone is convinced that their DSLR should be always free of dust, they shouldn’t shoot with a DSLR in the first place. Even if one never takes a lens off, dust will still make its way into the camera chamber through other places (mount, lens, etc). Dust is a very normal problem that we see in cameras and lenses. The D600 is an abnormality, because its shutter generates very high amounts of dust/debris that end up on the sensor, which is why the shutter needs to be replaced. Many thanks for such a detailed reply. Like you I’m fed up of all the misunderstandings with this issue. I have posted responses suggesting the use of Eclipse methanol or the excellent Eyelead gel stick for those with an oil/grease problem. But your answer leaves me with another question regarding my own 600. I purchased it in October last year but am not sure when it was actually made as it could have been sitting on the retailers shelf for a while. I’m in Hong Kong where turnover of equipment is fairly fast. I have around 2000 shutter count so far and haven’t been plagued with any excessive dust, in fact I haven’t sent it to Nikon at all as I don’t like the idea of being without it for a couple of weeks when I can easily clean it myself, but should I insist on a replacement shutter unit to at least prop up the already diminished resale value? Also my understanding was that replacement shutters are not the same as the 610! Could you clarify this for me. Many thanks again for taking so much of your time to reply. I assigned the Function button to display the viewfinder grid (since I don’t want this on all the time), however in testing this out, when I compose my shot and then press the Function button, no grid displays… am I doing something wrong? Dave, you are not doing anything wrong – you are just not finishing it up :) While pressing the Fn button, simply rotate the rear dial and it will turn the grid on / off. Ahh..! Perfect! Thank you Nasim! You about how you set up vivid, you know saturation, hue etc. as I like to shoot in that mode. Thank you so much. Love your info. Great article, as usual, Nasim. Quick question: In shooting moving subjects (say birds), what is your experience/recommendation regarding the 3D setting for AutoFocus area versus just 39 point or some sort of spot focus? Thanks for thoughts. Hello, excuse my English (google / translate). I really appreciate your links because the chance of asking questions to us novice. Now my Nikon D600 is the center for replacing the shutter, this was a good deed for the Nikon. I use to take pictures and video footage, even if it is uncomfortable to view live-view screen that captures all the highlights, and I wonder if there is something on the market that can help. My question is this: I film in 720p at 60 frames, using “Final Cut Pro (7) or after effects (12)” how should I do to see the movie slowed down? This article was really helpful for me! I love your blog Nasim! Always so helpful. I decided to try out the settings on my D610…and now my camera is not autofocusing AT ALL. I went through all the steps a few times…I’m not sure where I went wrong. I have to focus everything manually, in M or A…I have a 50mm 1.8, and I also tried my 85mm 1.8 to see if it was a lens issue rather than a camera issue. Still no luck. Any suggestions would be so incredibly helpful! Mary, if you did everything per my recommendation, your autofocus function has been moved to the rear AE-L / AF-L button. Please read the above article again and check out the focus and recompose technique. 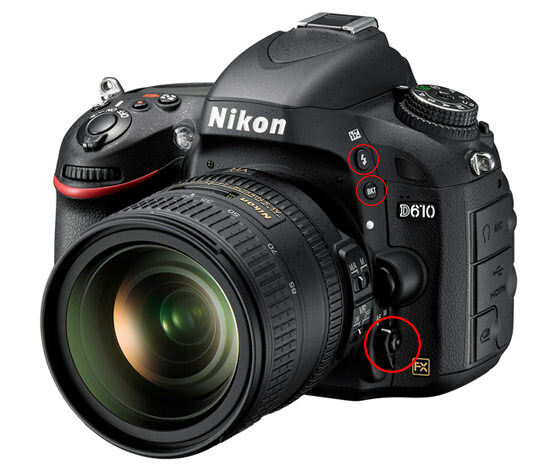 what is crop mode in Nikon D610. How to use it with the camera. what is mean by crop mode in dslr. How to use this mode in Nikon D610? Images from lens designed for “crop sensor” cameras (a DX lens in Nikon terminology) cover the area of the smaller sensors used in DX cameras. If you use a DX lens on a full frame (FX) camera, one that has a larger sensor like your D610, the image does not entirely fill the FX sensor. If the Image Area is set to Auto DX Crop OFF, the remainder of the frame is filled by a black circular area outside the image. With DX Crop ON, the camera crops out this outer area. Since only the area of the sensor with the image from the DX lens is recorded, the resultant image files are smaller. In DX Crop mode with a DX lens the image size is reduced to 3,936 x 2,224 pixels and the total pixels used to record the image drops from about 24m to about 10.3m. When using FX lens, the images are unaffected whether you have the DX Crop set to ON or OFF. Hope this helps. Read a plain number as if it had a 1/ in front of it. Thus 50 is a fiftieth of a second, 1/50. If the number has ” after it, it is a number greater than 1 second. Thus 4″ is 4 seconds. What I found very helpful is to have a reference book that explains how to use the camera, how the functions work and what they actually do. The one by Darrell Young “Mastering the Nikon D610” explains things clearly, but I am sure there are other good choices as well. Hope this helps. plain numbers and numbers like 2″ and 2.5 30″ 25″ 8″ what does the ” and the . mean, please explain?? When the time value shown in the view finder has a ” sign after it, it means that the exposure time is in seconds, not parts of a second. So 2″ means the exposure time is 2 seconds. Numbers like 2.5 means the exposure is 1/2.5 seconds so 0.4 seconds, slightly less than a half second. Hope this helps. “… What I have found very helpful is to have a reference book that explains how to use the camera as functions …” What and The Name of the Book and the author? The book called Mastering the Nikon D600 by Darrell Young is helpful. From reading the reviews, a similar book, David Busch’s Nikon D600 Guide to Digital SLR Photography, may have a bit more info regarding lens selection and info about the Nikon flash system. Very slightly cheaper besides. Really Useful Article. explained so nice and so easy to understand the things. My D610 is on the way. Cheers. Love from Pakistan :) its helped me a lot and made me to use all the buttons which were little unnecessary before reading this article. God Bless you!!! Im new to photography. I just purchased a nikon d610 . i noticed that when i record video, the shots are always being auto refocused and record the sounds of the lens focusing. is this normal? or a defect? Patricio, I’m not sure about the issue with shots always being refocused. I would think there must be a setting for the camera to either autofocus all the time during the clip, or the camera to only autofocus when you push the shutter half down (or back button autofocus, if you have it setup that way), and finally full manual focus. With the issue with hearing the focus motor, some lens have a loud motor and some other have a quite motor. When you use the built in mic you will hear every moving on or in the camera and lens. It because there is no buffer in between the mic and the vibration. You could try a shotgun mic like the Rode VideoMic Pro, but it could still pickup the sound of the focus motor. To completely solve this problem you must record the audio off camera. Then it wouldn’t matter how loud the focus motor is, in the lens. You have stated that ADL should be turned off when using RAW. I tested this today and found that there is definitely an improvement in my photos when ADL is switched ON. Due to the high degree of haze in today’s air, I set the ADL parameter to HIGH and it certainly affected the results. ADL is not used all the time, but, when it is needed, I do use it. PS: I usually send all my emails using BCC, even to one person! No spammer has yet figured out how to access addresses sent via BCC. The RAW image will not be affected when ADL is turned on. The preview image you see on the camera display is a JPEG so will reflect the settings, and if you shoot RAW with JPEG as your file mode then the JPEG saved to the SD card will also reflect the settings but the RAW .nef file will not. Mark, thanks for fast reply. I did not check results in camera because I know this is JPEG and not RAW. The results were checked on an iMAC computer after downloading file from SD card to a directory on the computer. However, I shall run more tests tomorrow and will respond accordingly. OK, I’ve done some reading about this and some test shots. In camera I noticed that in A mode the shutter speed would change to a faster speed when selecting Active D, so effectively (on the max setting) you’re underexposing by upto 2 stops. This effect is only usable if using NX2 software to post process since the effect is encoded into the RAW file metadata and NX2 then uses that data to apply the effect. If using Lightroom (and I guess PS) then the data cannot be used and the likelihood is photo will be very underexposed and too much to easily correct! There’s some interesting reading on this photo.net discussion. I do use LR so will now make sure to turn this off rather than Auto as I had it set to. Just for anyone reading this the underexposure with Active D on is designed to protect from blown highlights, so the Active D algorithms then lift the shadow details reducing contrast, and giving the appearance of more balanced exposure. The trade off is that noise levels in the shadows are significantly increased. In the Rockynook D600 book the author suggests only using this setting if shooting JPEG’s, because any effects ideally need to be applied in camera to a JPEG rather than making adjustments in destructive post processing (RAW processing is NON destructive). He also states he would use only Low or Normal settings as the higher settings start to look artificial. So in conclusion if you only shoot RAW (as I do), and use either LR or PS to post process, then Active D is best left off! But if you use JPEG then Low and Normal are preferable, but experiment to see what suits your style best! Mark, you are absolutely correct regarding the shutter speed settings when one photographs in RAW and tries to use ADL – the camera, if set to Aperture priority, will change the shutter speed to correspond with the level of ADL set. I have learned my lesson and will keep ADL set to OFF whenever my camera is set to RAW format. Any chance of updating this article to include setting changes (800e vs 810) you might make particularly for landscape shooting? Great information (as always). Question, though. You correctly state that the auto iso setting is buried in the menu but when the rear panel iso button is pressed and the sub-command dial is turned it seems to go in and out of auto iso. I’m sure I’m missing something. Please clarify. I have a Nikon d600 and would like to take pictures of my grandchild. Inside lighting and would love to know how to set my camera. I have the SB-910 flash too. How do you clear the ISO settings off the LCD screen? I was playing with various settings and now I can’t use the LCD screen for other than checking ISO settings. I really like the write up it helps a lot. I was a Canon shooter but I made the switch to the D610 and I love the camera. I am very unfamiliar with Nikon’s menu and this was great. I wanted to also know does anyone have any good recommended settings for general low, medium and high ISO, sharpening and noise reduction for the RAW images in Lightroom? High ISO’s are not the 600/610’s stongpoint so generally I try not to go above 3200 as a max and 1600 generally. However there’s a really good article here from Adobe on how to remove noise in PS. Thank you so much for this post! So helpful!!! I did not read all the comments, so I am not sure if someone posted about this, but you can easily change ISO by pressing the -magnifying glass on the bottom left (next to the LCD, it also says ISO above it) and moving the wheel in the back top right (right next to the AE-L/AF-L button). Press the button, move the wheel, change the ISO. You see the info changing in the little screen by the shutter button. Also in A mode you can assign the rear command dial to change ISO without the need to press the ISO button. Nassim, Thank you! this post is very helpful for me as begginer with the D610. the focus points or does not display them in the playback screen. I was noticing the same thing! I am thinking because when I focused and then recomposed I did so outside of the “focal box” so there isn’t but I’m not sure…. MY auto focus is off. I have to use manual focus after following your set up. Why? Thanks great tutorial just picked up my new D610 August 28 with 24-85 lens your tips really helped, so much easier than the book. I have been shooting Nikon DX’s D80’s D90’s & recently upgraded to Nikon Full frame FX D610 with backup DX D7100. I LOVE the D7100 & it performs beautifully – guess I expected that from an upgrade with great low light capability but I am just not sold on the D610 at all. The images are just way too dark & I HATE having to remember to compensate +01 for indoor shooting with natural lighting – especially when combining with 50mm 1:8 lens which should be an awesome combination. My Nikkor 35-70mm 2:8 shoots dark too! The same 50mm 1:8 & 35-70mm 2:8 work great on my D7100. My ISO settings are Low 100 & high 6400 ( I kinda like a little noise ) Post processing takes care of too much noise. Wondering if I received a bad camera? Your thoughts on how to test why this would be showing dark ( even vignetting ) ………………………….? Was thinking to maybe put indoor natural lighting shoots on U1 or U2 just so I don’t have to remember to compensate every time the situation arises? Hi Paul, just while you wait for Nasim to reply I was just thinking what metering are you using? I don’t have any exposure problems with my D610. If anything it sometimes slightly overexposes in Matrix mode. Just something to check is that, assuming you’re shooting RAW, you’ve turned off all the in camera noise reduction etc? Is the underexposure consistent through the aperture range? But the fact that you’re seeing this across a range of lenses would suggest some sort of fault! There has been a recent firmware update, just in the last few days, so another thing to try might be to update it and see if the problem’s persists. Mark I generally always use Matrix metering but have actually been switching to spot with the D610 indoors which makes a big difference & brightens up the dark pics & fringes quite considerably – a lot of the time just too much! I always shoot RAW on a ‘paying’ project but mostly don’t bother when it is for personal photography- then I will shoot Jpeg unless of course I decide to do a personal studio shoot then it is back to RAW. Even so Mark I don’t want to have to do loads of post-processing because the camera shoots dark images in low light with good glass.Oh yes I don’t have noise reduction turned off as I actually like a little noise at high ISO but highest for me is 6400 ( acceptable ) I figured being a full frame would give me more light TTL onto a bigger sensor hence brighter images at low light as you mentioned but…………………..? Thanks for the info on the new firmware release I will check it out & hopefully it may address my current problem. Hi Paul, Pleasure to help. I mostly use spot or centre weighted unless doing a landscape when I’d use Matrix. Thinking about it the noise filters aren’t the problem anyway. The D610 isn’t renowned for low light qualities but then it’s noise that’s the issue not exposure. The new FW only adds some lens data for the cpu so it may not have any effect but you might as well do it anyway. Then you’re only option is to send it in to Nikon as it maybe that the meter needs calibrating (I’m purely guessing now!!). Good luck anyway, let us know how you get on. Did suggested FW update but as you say it’s just a lens correction upgrade. Think I’ll stick with it for now & if it persists get it back to Nikon before the guarantee expires! Actually has some ‘tweaks’ in the menu I may just be able to work with but it is a challenge & an unwelcome one having expected more from this unit. With a D600 I find the matrix and spot give about the same and correct (assuming the spot is on a typical part of the image) exposure and center is a bit darker. All are acceptable, however. You sound as though you are a experienced and capable user. A “dumb” suggestion: You didn’t happen to accidentally put in a negative exposure compensation value? I find the D600 is a very capable camera which produces better image quality than a crop sensor camera (in my case a D7000.) You may have to consider that your D610 does need a meter adjustment/replacement. Good luck with problem. It’s funny you say that because when I bought my D600 (I’m one of the luckier one’s that got a D610 replacement) all my shots were very underexposed. It was a while later that I discovered it must have been used as a demonstrator in the camera shop, as there were scratches around the HDMI port and someone had dialled in -3 stops Exp comp!! I’m convinced there’s a fault in Paul’s camera and the thing is don’t wait, get it off to Nikon (if you live anywhere in the London area then take it in person and get them to look at it while you’re there) and get it sorted out as there’s no point struggling with it when it could be a simple fix. I’ve been googling around and there are some comments about under and over exposure, but it doesn’t seem to be a widespread issue which is even more suggestive of a fault. The first thing I noticed about my new D610 was the focus area was so small. It was literally just the middle part of my view in the viewfinder! I thought there was a problem. I even called Nikon. For some reason they had me turn the dx crop off. But you say to turn it on (I’m assuming that’s for when you use a dx lens, it knows what to do?..) After much confusion they broke the news to me that that was the whole focusing area. I’m surprised I haven’t heard more people complain about this?! So, I am glad you have an extensive section on how to focus and recompose. I’m still upset though because that is another step and in photography a millisecond wasted may lose a good shot. Even though the D610 has a relatively small focus area, there is an easy fix for those who want to focus something which will end up being outside the focus frame when you want to actually compose the shot. After you have focused what you want and before moving the camera, turn the AF switch on the bottom front left side of the camera body to MF. Now, your focus point will hold regardless of where the camera is moved. This has worked for me every time. Quite simply it allows you to use DX lenses on the 610. Marilyn, as further info on the DX setting in the D600/D610, the setting ‘Auto DX’ recommended in the article above keeps your camera on full-frame mode, except when a DX lens is put on it. The camera senses the DX lens and automatically switches the image area used to the DX crop, using only the center part of your sensor, as those lenses produce a smaller usable image to fit the smaller DX sensor cameras they were made for. I don’t own a DX lens myself, but leave the ‘Auto DX’ set because it does not bother your shooting at all. When I first got my D600, I thought it would be great to effectively double the zoom power of my lenses by switching to a DX crop in the camera by manually switching the setting from FX to DX when I wanted more zoom power. I’ve stopped doing this, because it is not really giving you more zoom, only masking out all but a DX sized square in the center of your sensor. With the camera set to DX, you’ve limited yourself to having a smaller-sensor camera. The image only looks more zoomed because the camera is doing a picture crop for you before you even start post processing. By leaving the camera in FX even when you want big zoom, you can do the crop yourself in post-processing and get the crop exactly as you want it, perhaps you’ll notice something in the outer edge of the picture you’d like to keep. By setting the camera to DX you lose that ability. With DX set you are telling the camera cut out the parts of your sensor larger than the smaller DX sensor-sized square in the center of the frame. The storage number really does not matter too much, as all pics will still be stored on your SD data card(s) anyway. For sorting my pictures, I use this function from one vacation trip to another, or shooting event to another, by using the File Folder function in the camera to bump up the file folder number by one before starting out on a new trip. This keeps all the pics from each shooting event on one place, making it easier for me to download to my computer all the pics taken during the shooting event, such as ‘trip to Grand Canyon’ for example. Also, I’ll change the file number for each major trip or shooting event with a relevant prefix, such as GND0001 for ‘trip to Grand Canyon’ for example. This has been awesome! Thanks a lot. I will definetely read through again and again until I have my hands on the settings. This has been awesome! Thanks a lot. I will definetely read through again and again until I have my hands on the settings. you have been a blessing! I just bought a D610 and wish to thank you for your excellent articles….VERY clear…VERY useful….joined to learn more! Hi Nasim, I was wondering about the 39 points for focusing in the view finder, I click on that but when I look in the view finder, there is only 1 point and that seems to be sitting in the left of the picture. I used to see all the focus points but now I only see one HELP. Check your metering setting also. Center weighted area will pick a single spot, while average will pick an average for the whole picture and may not be correct exposure for certain scenarios. Are you using Auto WB? Choosing the correct White Balance for your scene instead might help. Sometimes Auto WB can have trouble with too much in the scene. I am just guessing that is what the problem might be. Hope it helps. I just upgraded from an old Nikon D2x, so I am thankful I found this, helped me out tons with a new system. In the Playback Menu>Playback Display Options you can choose several “views” during playback. Focus point is one of the options. Check it, and any other views that you find helpful. Use the Multi selector around the OK button to toggle between the options you have chosen. Thanks for this working my way through. It seems that in the AF-A mode the D610 will use the LED to illuminate close subjects in low light while focusing. Switching to AF-C and AF-S it is not doing that in the test I’m doing at the moment. Perhaps there are other settings that can override that particular assignment for LED focusing lamp that I’m not aware of yet. I just purchased a D600 and a Nikkor AF 85 1.4D, however the camera does not fire. It does with my other lenses. Is there something I need to know. Try setting the lens to its highest f-stop value, ie f-16. Camera then sets what you choose or is appropriate. Thanks Orion, but you say that the L symbol on the back right has a dot an F and an OK button. I don’t have an F only a dot and the L. Was that a typo? Yes, it was a typo. It is the L symbol as mentioned earlier in the response. Hope that helps. Do you have a bin file of these settings you can put up for download? I have the D610, and just recently started having some problems with it. Whenever I shoot in manual the settings keep jumping. Have you ever experienced this? You did not mention what metering mode you were using when you encountered the exposure problems. My experience is that the metering on the D600 works pretty reproducible, particularly using the matrix setting. In your situation, changes in the relative amount of sky versus land in your pictures may be the “problem”. More sky, for example, may be causing an underexposure of the part of the image of most interest, in your case the people. You might experiment with the spot metering mode, if you have not already done so. This would allow you can isolate the area of greatest interest for proper exposure. From my experience, the spot and matrix metering modes work well while the center weighted mode is a bit more variable. Hope this helps. he didn’t mention whether he was using a flash unit or not. I got wicked overexposure outside trying to use a flash. hello, i used to use the time lapse setting on my camera, but for some reason i can only take a 19 min time lapse. before i was able to do a time lapse for as long as i wanted but now i cant. does anyone know why this happened? Did you change the frame size, frame rate, image quality settings? The highest settings limit the movie length to about 20 minutes. Might you have run out of storage space on the card? Hi, is there any way to make the entire screen in focus when shooting video with the 610D? This doesnt happen when I am using a camcorder. But, with the camera, only the center remains focused, while he rest is blurry? I am sorry if this is a beginners question, but, yes, I am new. I would appreciate any help or advice. Now the photos are not 100% Sharp as I do a lot of Portrait shoots.. There OK backed off, but when I zoom up the focus (Like Eyelashes) are not Crisp.. This camera is an upgrade from my D300s and should be as sharp or better.. Welcome to full frame. You now need to calibrate your lenses. Plenty of info online about this, and Nasim has a whole article about just that. Is there a way to Remote Video Start with the D610? It seems to only remotely capture photos but not video. How can I set my current camera total shoots, in my case is 40491, if I changed the option “File Number Sequence” to off? If I take a picture and rename on memory card to the current and real number of shoots, when I turn on the camera again, it not recognize the picture, showing that is an empty folder. HELLLLLP! I have been struggling with a problem for a month, off and on, and it’s time I find a solution – I’ve tried to figure this out on my own and cannot. I have the D610 and when I attach my SB-700 it is strobing 4 times before taking the photo. I have my camera set on Manual and I’ve looked thru my settings over and over and cannot figure out why it’s doing this. I would really appreciate help on this!!! Your camera is set to Anti Red Eye flash. The 4 strobes you see are the pre flashes to make the subjects pupils contract. The settings are changed by holding the flash button and rotating the command wheel. Oh jeez MARK, you’re my hero…that was it! I can’t tell you how long I’ve been trying to figure this out on my own….sadly. I fixed it, just like you said. Thank-you, THANK-YOU! You’re welcome. I did the same myself on an event shoot. Must have changed the setting without realising – took me ages to figure it out!! greetings I am a first time user of D610 and I am starting to enjoy. but I am using DX lenses what I am I missing? With crop sensor lenses (DX) on your camera you are only using about 42% of the FX sensor area to record the image. While you retain the advantage of the larger pixels, the ability to make larger images/prints is lost. Best to upgrade to FX lenses to take advantage of the camera’s quite good image quality. I have moved AE-L/AF-L button to use AF-ON and I am in AFS-C. I am using the center point as a single point focus. How do I dynamically track a moving subject (say a cyclist) but want to compose my cyclist at the 2/3rd of my frame. When I hold on to the AF-ON button and try moving away from the middle to recompose my cyclist, the focus goes to the mud/ground and not locked on to the cyclist. When using the AF/L, once you focus on something by pressing the release button half way and then simultaneously press the AE/L-AF/L button, when you redirect the camera the focus will not shift to new focus point but will remain focused on the original subject distance. So in your case, focus where the cyclist will be when you want to take the picture then press and hold the AF/L button. While holding the AF/L down redirect the camera to place the cyclist where you want her in the frame. If the cyclist moves to a different distance from the camera, the subsequent pictures will be out of focus until you release the AF/L button. If the distance from the camera is changing and the cyclist is moving within the frame, you might try using the Focus Tracking mode (rather than a single point) or use a single point focus (or perhaps a few more focus points) with the initial focus point not in the center of the frame, but off toward the point you want the cyclist to be in your composition. The problem with the latter may be that the coverage range of the focus points available within the view finder range for a D600 is fairly limited. Good luck! Hi Nasim. just read your article for the first time , and thanks for a great job . I noticed you said you have a d600 and a d610 ? reason I ask is I have (2) d600’s one of which i had shutter replaced for oil spots the other is fine . I really love the way the d600 operates and handles but the camera w/oil spots has spots once again . My fear is they will replace it this time with a d610 since it is repeating the problem . Do you feel the d610 is as good? dxo gives the d600 a higher rating and I would rather request a repair on my d600 as to a swap-out if it is not going to perform like my other d600 . I would hate to think I favor one over the other due to lack of performance . Your opinion from experience would be much appreciated . Great article, really helped me make the transition from a cropped to full frame camera. I couldn’t figure out why my Nikon D610 was taking what looked to me like cropped images. I took some photos with my D90 with a DX 50 mm lens and D610 with a FX 50 mm lens and the images looked alike. I was stumped until I read your article and learned how to change the setting on my 610 and now I am thrilled with my full frame photos. I don’t know why I couldn’t find another article on the internet that explained that. Thank you! Why would we do this when the D600 already has an ISO quick change button on the rear lower left side on the back of the camera body? As a test, try setting your lens to manual focus. Under your lighting conditions it may be having trouble focusing. With auto focus if it can’t focus it won’t take a picture. Another of my favorite mistakes is to have the camera set to remote release and then trying to use the release button. Or vice versa. It’s a swell camera. I hope this helps you to get started. just followed all your instructions tonight and i’m happy to say i already see improvement.. its night time now so i took a photo inside and to my surprise my photos are not orange lol!! they are now the right color!! Will try it outside tomorrow again and hopefully things have improved there too!! well done article congratulations are recently in possession of a Nikon D600 and I found his settings very useful. What settings would you use when doing astro photography with a f3.5 lens? You didn’t say what you are trying to photograph. Below assumes it does not include a “full moon”. If the moon is the subject then the recommendations may be quite different. For example, in photographing the recent moon eclipse, the full moon part was shot at f9,1/160 sec, ISO 100 and 280mm. The fully eclipsed moon was shot at f9, 1/5 sec, ISO 1600 and 280mm. It was possible to focus on the moon. After the initial focus, autofocus was turned off, as recommended below. Focusing: If you can pre-focus the camera in the daytime on something very far away that is the easiest method, and then turn off auto-focus off. One way to focus in the dark is to use a bright flashlight and shine it on something out, say, 30-40 feet. This suggestion is based on using the hyperfocal distance, a shorter focal point at which “infinity” will still be in focus. The actual hyperfocal distance is dependent on the focal length of the lens and the f-stop being used. Focus as far out as practical, after focusing, turn off autofocus then reframe to take the picture you desire. Auto focus lenses actually will go past infinity, so you can’t just trust the markings on the lens. •	Shoot Raw file format. •	Set the camera to manual exposure mode. •	Set camera lens to widest aperture (f/2.8 is better than f/4 or f/5.6). •	Set the shutter to the 5 seconds. Try different exposures. Experiment! •	Set the ISO to at least 1600. •	Set the White Balance to Daylight or Sunny or use a Custom White Balance. Auto White Balance seems to work OK as well. •	Using the long exposure noise reduction is a help in getting a “cleaner” image, but it does double the time it takes to make long exposures. To prevent “star trails” the 500 Rule is a great starting place. The 500 Rule: 500 Divided By the Focal Length of Your Lens = The Longest Exposure (in Seconds) Before Stars Start to “Trail”. For example; let’s say you’re taking a shot with a 24mm lens on a full frame camera. 500 / 24 = 21 seconds, which you can round to 20 seconds. Hope this helps getting you started. Happy shooting!